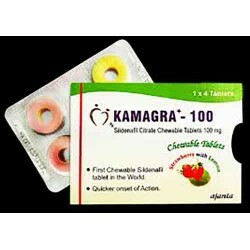 Kamagra Polo Chewable Pills are made from the Giant (Ajanta Pharma India) Each Pill contains 100mg of Sildenafil Citrate they start to work quicker than any other sildenafil tablets within 10-15mins and the effects can last 4-6 hours! melt/dissolve in your mouth and is available in tasty Strawberry and Lemon Flavour. Dosage: Please do not take more than 1 Pill of 100mg Sildenafil Citrate within a 24 hour period. There is a fatal reaction between ED tablets and nitrate medication, including GTN spray. Do not buy ED medication from us if you have a GTN spray, tablets, patch, gel or cream or take nicorandil or any nitrate tablets (usually prescribed for heart conditions). You need to see your GP to discuss alternative options.